Fri., April 28, 2017, 11:11 p.m. Depending on how much you can really learn from a spring game, Idaho would appear to be unstoppable on offense next season. 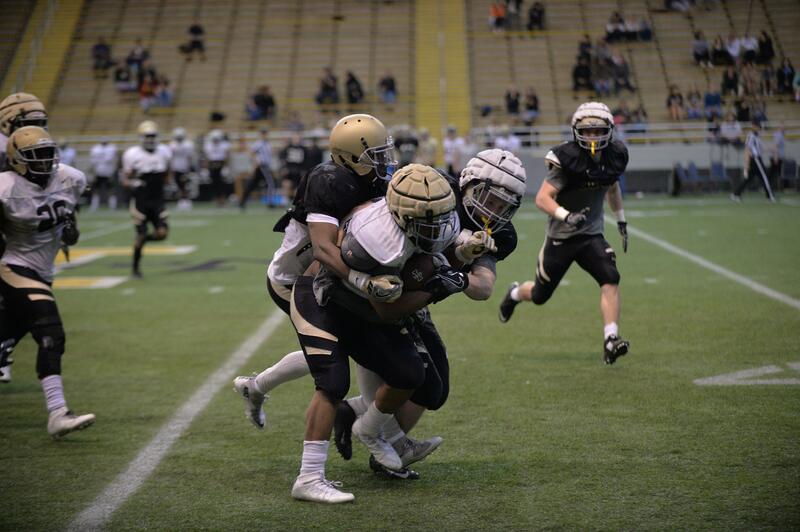 In the annual Silver and Gold game in the Kibbie Dome that concluded spring practice Friday, the Silver team first offense, led by senior quarterback Matt Linehan, rolled to a 70-20 advantage over the Gold team second defense, a margin so ridiculous coach Paul Petrino whistled the affair to a conclusion with 13 minutes to play. Senior wide receiver Jacob Sannon connected with Linehan for three touchdowns, and junior running back Isaiah Saunders scored and ran for impressive yardage on close to 20 carries, though no official statistics were released. On the opening series of the second quarter Saunders battered the Gold defense for eight yards, seven yards and eight again on three straight plays, running through sophomore safety Gunnar Amos and sophomore linebacker Aaron Pue on the final carry. An imposing offensive line sealed off pursuit from outside linebackers and simply shoved everyone in the middle of the field back about five yards to give the ball carriers an almost unfair head start. Linehan never seemed to have to throw under pressure. At the start of spring practice, Petrino had said identifying five consistent linemen was a priority. Petrino singled out senior tackle Jordan Rose, redshirt freshman center Connor Vrba and sophomore guard Zion Dixon as having a successful spring. In addition, he says he has improved at tracking deep balls and running after the catch. At halftime, Petrino was surprised by his father, who presented him the Sun Belt Conference coach of the year award. “I didn’t know anything about that. They kept that a secret. It was a very special moment,” Paul Petrino said. Last year’s seniors were presented rings for their victory in the Famous Idaho Potatoes Bowl. The mother and the wife of the late Jace Malek were also given rings. Malek never played a down of football for Idaho after being diagnosed with cancer before his freshman year, and he died two years ago. But his example as a student coach while he fought the disease has become part of Vandal culture. Published: April 28, 2017, 11:11 p.m.